In 1969, after not so quietly developing in the Britain’s inner-cities over the months that had followed the demise of the once all-prevailing mod scene, the working-class youth subculture that became known as ‘skinhead’ exploded into mainstream British consciousness. The popularity of the new brash style not only shook the country’s establishment to the core, it also helped propel the exciting new sound from Jamaica into the national pop charts: Reggae. Providing the ideal antidote to the perceived pretentiousness of prog rock, its throbbing, faced-paced style pulled no punches, with its simplistic and rhythms in stark contrast to the elaborate music widely favoured by many of the skinhead’s more affluent peers.>br> By 1969, the skinhead look and the sound of reggae had become synonymous and to mark the 50th anniversary of the year when both broke internationally, Trojan proudly presents this superb 2CD set comprising 58 classic skinhead favourites, all of which were originally released by British-based record companies half a century ago. 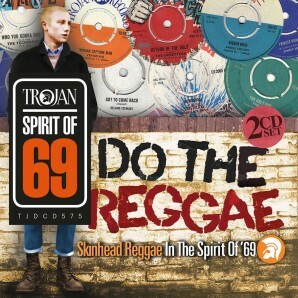 Stylishly complimenting the two previously issued ’Monkey Business’ compilations, ‘Do The Reggae’ forms part of the ‘Spirit of 69’ anniversary celebrations, due to take place in the UK and Europe throughout 2019.